2018-07-06: Over the first 1.5 years since the first Spectragryph release in 2016-11-11, the software was downloaded > 21,000 times. The download form was filled in about 14,500 times by 10,700 verified individual users from 133 countries. 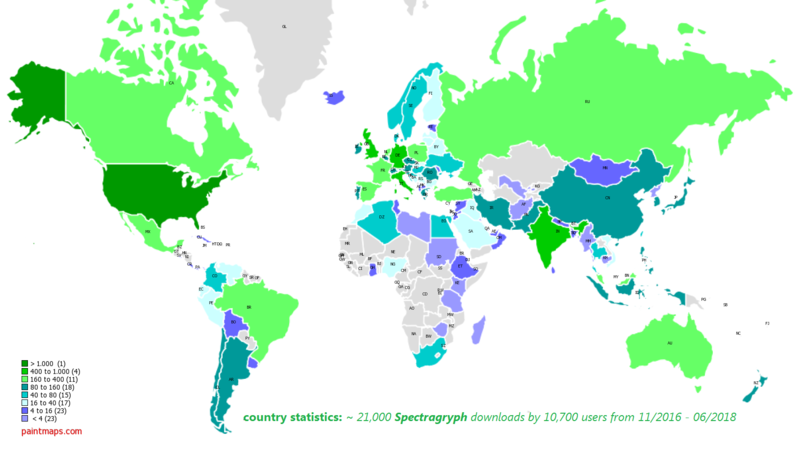 Here is a statistics of where these users come from in the world. See a listing and world map below. The "top five" countries are responsible for 40% of the downloads. India is on third place! Here is a link to a similar statistics overview for the previous Spekwin32 software.